The Jagua Gel tattoo is undeniably one of the best formula for temporary tattoos. 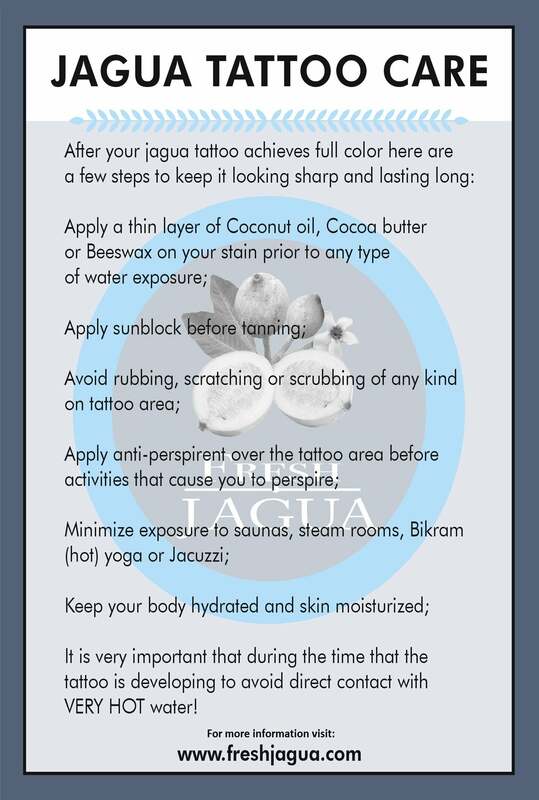 This undiluted formula for temporary tattoos is the result of in-depth research and series of tests courtesy of Fresh Jagua. One unique feature of OUR Jagua Gel BLEND is that it is a 100% PURE AND pasteurized mixed Gel with the FRESHEST highest quality European food-grade ingredients. This distinguishes it from other tattoo gels that are synthetically manufactured. It does not have any form of alcohol, toxins or P.P.D. The Jagua Gel Ink for temporary tattoos is made of great natural ingredients which include: Organic Genipa Americana Fruit Juice, Xanthan Gum, and Organic Lavandula Angustifolia Oil. You can select any of the products that suit your needs from the list of products we have. We have the 8-ounce Bottle of Fresh Jagua Tattoo Gel which will definitely keep your business thriving. You can simply squeeze the amount of gel needed for the day and store the rest in a cool location for a maximum of 30 days. Whatever size you need, we have it already settled. The gel sizes available ranges from as much as 16 ounces to as little as ½ ounce bottle. Our unique Jagua ink and Gel is all you need for your temporary tattoos. Our sixteen ounce bottle of top quality Jagua ink tattoo gel is ideal for supplying a multiple venue..
8 ounces of our top quality fresh Jagua ink tattoo Gel will keep a thriving business well supplied. ..
4 ounces of our top quality fresh Jagua ink tattoo Gel will keep a thriving business well suppl..
1 ounce of our top quality fresh Jagua ink tattoo Gel is the perfect size for occasional business an.. This small bottle of our top quality ink Jagua tattoo gel is the perfect way to familiarize yourself..
Our kit contains: 1. oz (29.57ml.). Fresh jagua tattoo gel 1 - Small screw bottle cup to hol..
Our kit contains: 1/2.oz (14.7ml.). Fresh jagua tattoo gel 1 - Small screw bottle cup to hol..